Antarctic exploration doesn't follow the rules. The fascinating history of this region is about explorers overcoming all obstacles to reach one of the harshest climates on Earth. Many even defied public and political opinion to go beyond chartered territory. There is still much we don’t know, and there are many mysteries to resolve. October and November 2018 offer a rare opportunity for Antarctic history enthusiasts—even for those who visit often, like myself. I was enthusiastic to sign on to lecture aboard the icebreaker Kapitan Khlebnikov as Quark journeys to Snow Hill, a fascinating and seldom visited island in the Weddell Sea. It’s an exciting place for us to visit, given its significance to the Heroic Age of Antarctic Exploration. We also know that this Late Cretaceous-period island formed in the last part of the Mesozoic Era, giving it a lengthy and rich geological history, as well. A well-preserved hut still stands at the north end of the island, where Otto Nordenskjöld leading a 6-man expedition spent two austral winters from 1901 to 1903. 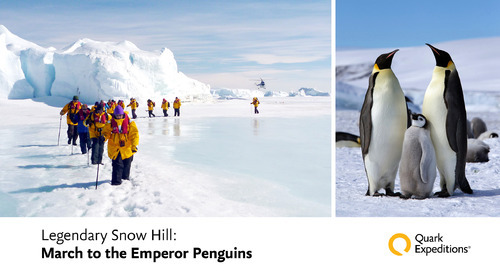 Snow Hill is also home to the northernmost Emperor penguin colony in Antarctica. 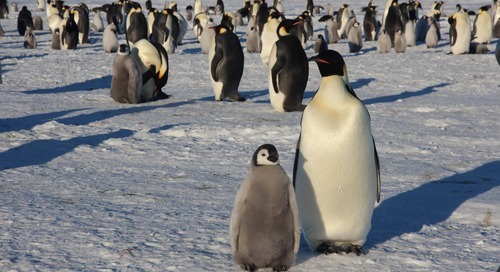 Some 4,000 breeding pairs tend their eggs and raise their young on the Weddell Sea pack-ice off the southern edge of the island, in the most inaccessible Emperor rookery on the planet. It’s certainly a challenge to get there, and Kapitan Khlebnikov is just the icebreaker to do it. Join me for just a few moments as we explore the fascinating history of Snow Hill Island, an Antarctic destination rich in biological and historical significance. Snow Hill Island appeared on Antarctic maps relatively early, but it was Otto Nordenskjöld’s first Swedish expedition to Antarctica that really put this remote island in the spotlight. In the years when these early explorers sought to investigate the region’s geology and biology, Dromaeosaur (bird-like theropod dinosaurs) remains have been recovered from Snow Hill, as well as the ornithopods Trinisaura and Morrosaurus. At the time of early human exploration, though, precious little was known about the seventh continent. A challenge had been laid down at the International Geographical Congress in 1895, when the Antarctic was described as ‘the greatest piece of geographical exploration still to be undertaken.’ This followed Norwegian Carl Anton Larsen’s early 1890s explorations, in which he had made a number of fossil discoveries on the Weddell Sea side of the Antarctic Peninsula. A geologist by profession, Nordenskjöld was intrigued and set out to investigate the geological connection between the continents of South America and Antarctica. Nordenskjöld’s was one of three coordinated expeditions during Antarctica’s ‘heroic age’: there was one from Germany aboard Guass, and British explorer Robert Falcon Scott was on his first Antarctic expedition aboard Discovery. 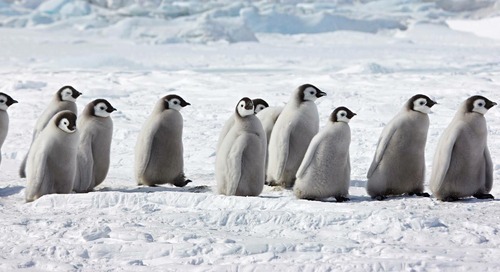 The groups each went to different places around the seventh continent, conducting what were essentially equivalent geophysical and meteorological experiments during an Antarctic winter. However, things went quite differently for each of them. Captain Scott’s expedition team were prepared to winter, but it still didn’t go as planned and they remained for two winters. The German expedition didn’t do very well at all; they couldn’t get onto the continent because of thick pack ice and so ended up beset on drifting ice about 80 km offshore. Nordenskjöld, on the other hand set up a winter station while his ship, visited South Georgia, Ushuaia and the Falkland Islands as they conducted their experiments. His team made the first major sledge journey on Antarctica, and he collected many scientifically important fossils and other specimens during his explorations. Nordenskjöld and his ship Antarctic’s good fortune ran out in 1902, when it seemed everything that could possibly have gone wrong truly did. Antarctic left the Falklands in early November to pick up the Nordenskjöld wintering party, but severe pack ice prevented her from doing so. When another landing attempt at the end of December failed, three men were put ashore and a depot established at Hope Bay, about 100 km from the station on Snow Hill Island to reach it by surface travel. In a devastating turn, Antarctic, while endeavoring to reach the station from the east, was damaged by pack ice, crushed, and sank, stranding her crew of 20 on Paulet Island. The three men left at Hope Bay attempted to reach Snow Hill Island, but were stopped by unexpected open water. They had to return to the depot to winter in very difficult circumstances. The crew of the Antarctic built a stone hut and wintered, also in great privation, on Paulet Island, while Nordenskjöld’s expedition team spent the austral winter of 1903 on Snow Hill Island not knowing what had happened to their ship. It was a mess. In November, the three men left Hope Bay to to trek to Snow Hill Island. Shortly after their arrival so too had the Argentine rescue ship Uruguay. As the group prepared to leave, the captain with some of the crew of Antarctic arrived, having rowed from Paulet Island. 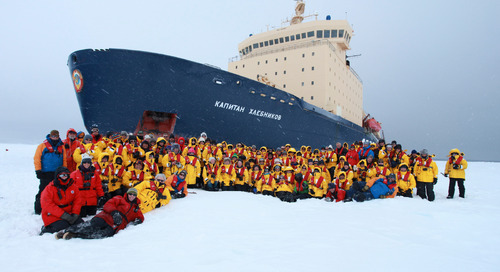 This was on November 8, now known as the ‘Day of Wonders’; all three stranded winter parties were united with the rescue ship. Maps, charts, many specimens, geophysical and meteorological data were secured which allowed a comprehensive contribution to exploration and scientific knowledge of Antarctica. 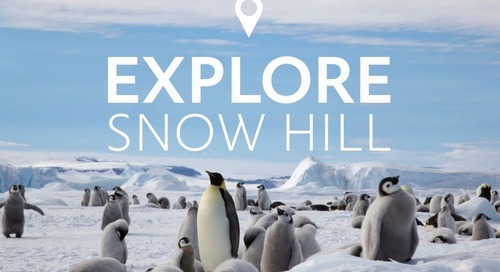 Should your Antarctic expedition find you at Snow Hill in November, take a moment to share in the celebration of the Day of Wonders with your fellow passengers and Expedition Team. Today, Nordenskjöld’s hut at the north end of Snow Hill Island stands in very good state. We know at least six men wintered there twice and from the late 1900s the hut itself has been effectively maintained by the Argentines, who have a station north of Snow Hill on Seymour Island. House of the Swedish Antarctic Expedition 1901-1903 on Snow Hill Island, Antarctic. You could say that Nordenskjöld’s hut is largely in good condition by being ‘in the fridge’, that is the Antarctic environment has done well to preserve this fascinating site. As with anywhere we visit in Antarctica, we take only photos and leave only footprints; visitors are urged to be respectful of the delicate nature of the relics we’re privileged to explore. Once Kapitan Khlebnikov has done the difficult work of getting passengers close enough to trek to the island, the hut is actually quite accessible in comparison to others around Antarctica. The 6m x 8m (19.7’ x 26.25’) hut has four rooms off the main room: three bunk rooms sleeping two men each, and a kitchen. Iron stoves were used for coal heating, so the expedition’s geomagnetic equipment and instruments were kept a short distance away. You can still see a lot of those original furnishings today; the coal-fired stove and the cooking equipment, for example. As one of the relatively few people on Earth to have stood in the very space where Nordenskjöld sought refuge from the severe winter conditions around Snow Hill, you may feel momentarily transported back in time to those very days of Antarctic history. It’s not uncommon for a few passengers to stand back in awe, after others have moved outside to explore fossils of clams and ammonites in the gravel ravine behind the hut, and just absorb the meaning of the space. No more than five people are allowed in the hut at a time, and times for visits are limited. 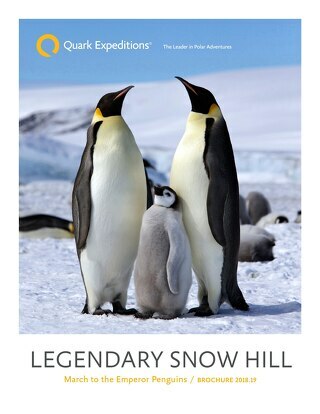 Off the other end of the island, you can walk along a guided route over thick sea ice to the world’s northernmost colony of Emperor penguins. 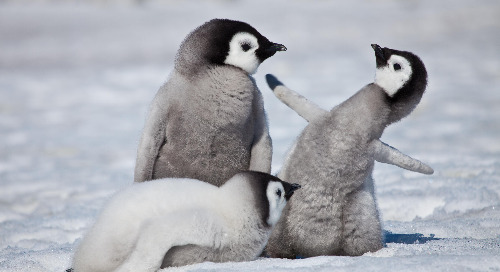 As resident penguinologist Dr. Tom Hart says, we aren’t sure if this particular colony was present near Snow Hill while Nordenskjöld and his crew were there, but it’s likely. 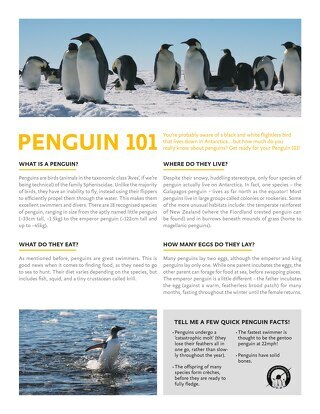 In fact, samples gathered by Penguin Watch researchers on our expeditions may help them understand a little more about the history and evolution of this particular colony. 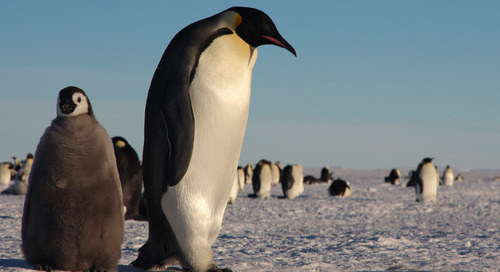 Will you join us in exploring Nordenskjöld’s hut and paying a visit to the brilliantly colored, stoic and almost human-like Emperor penguins at Snow Hill?